The beach of Bikini is located within the seaside tourist complex of Bikini. Located on the outskirts of Vico Equense, it is down road from Strada Statale Sorrentina (the Sorrentine state road) and around 11km from Sorrento. The beach stretches along a small rocky bay and consists of a beach made partly from fine gravel and some sand. 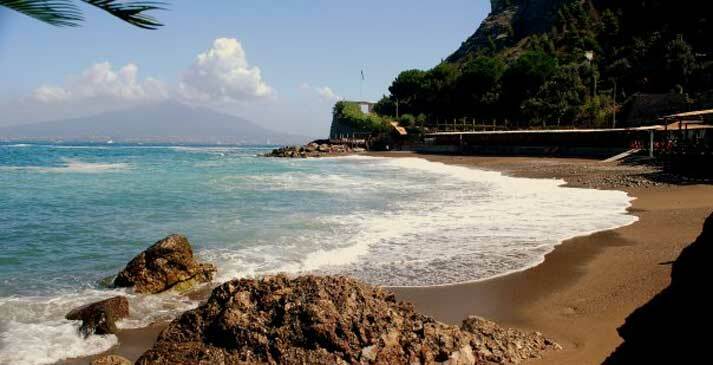 From the beach you can enjoy a splendid view of the Gulf of Naples and Vesuvius. The tourist complex “Il bikini” offers a vast selection of services: bar, restaurant, cabins, sun umbrellas, deck chairs, diving and boat hire for a whole day and week end. The establishment acquired in 1991, one of the three “Bandiere Blu” (blue flags) of Europe assigned to Italy.